Japanese milk bread is the fluffiest and softest bread loaf ever. It’s great on it’s own, with some butter, or a little condensed milk. Bread is my weakness. Crusty French baguettes, chewy Italian ciabatta, and this oh so fluffy and heavenly Japanese milk bread. Ever since my high school days, there have always been diets and fads telling me to stay away from breads. It’s not that I couldn’t do it, it’s just that I don’t want to deny myself something so tasty. I could give up chocolate, espresso, and maybe even whiskey, but refraining from breads…that might be a real tough one. For most of my childhood, my mom would only purchase two types of bread: Filipino pan de sal and Japanese milk bread. I grew up eating bread with a slather of salted butter, maybe a piece of hard cheese, or a giant spoonful of sweetened condensed milk (the best!). As I’ve gotten older, I’ve come to favor more heartier breads, but to this day, I still cannot enter an Asian bakery without buying a loaf of milk bread. Even if you’ve never made bread before (or you’ve been intimidated to try), this will be the bread that will change your mind. 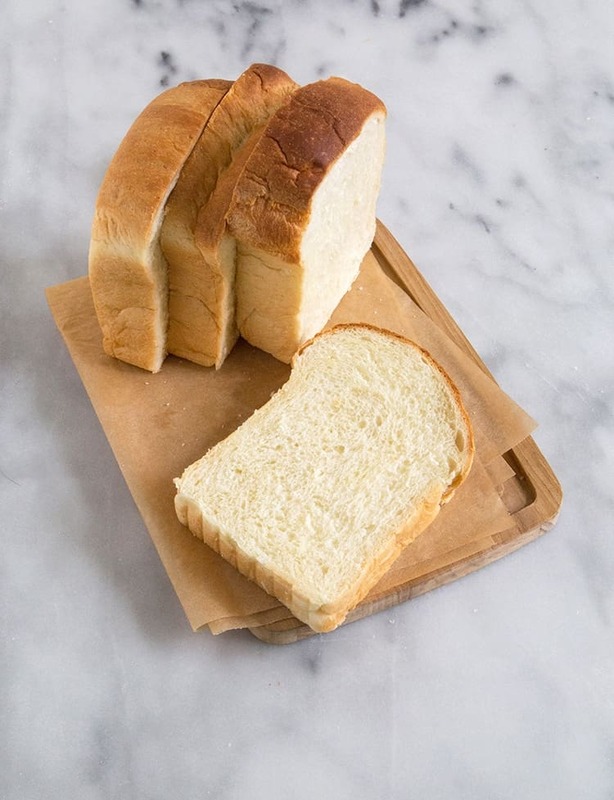 Japanese milk bread (also known as Hokkaido milk bread) is known for it’s distinct slightly sweet flavor and soft interior. The secret to this fluffy milk bread is it’s use of a starter (water roux). A simple mixture of flour, water, and milk creates this paste that helps to produce the fluffiest bread ever. Even four days after baking the bread, the loaf will remain soft and springy like the first day. Combining all the ingredients for the dough is fairly simple and straight forward. Once you’ve let the dough rest and rise for an hour, place the dough on a lightly floured work surface. Divide the dough into four equal parts. 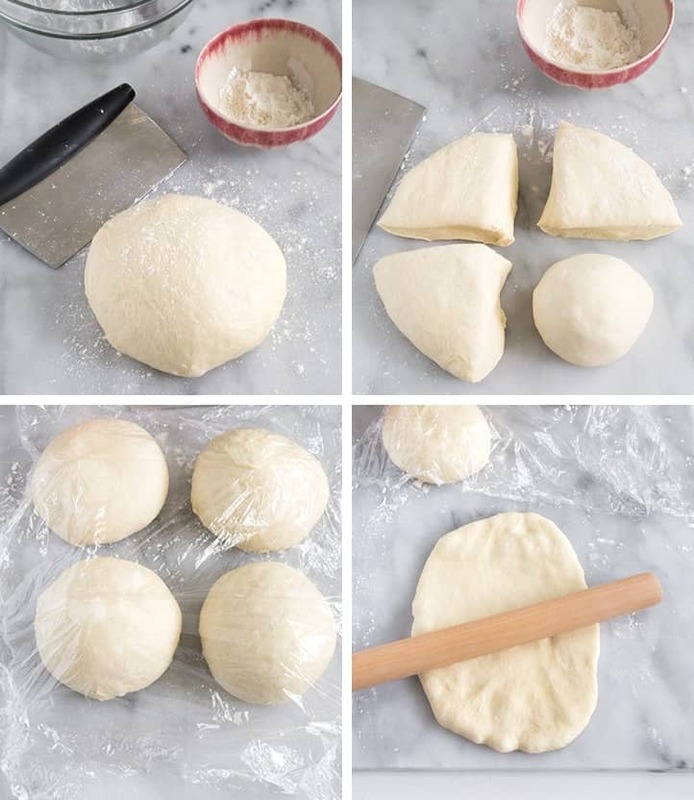 Keep the cut dough under plastic wrap to prevent it from drying out or forming an unwanted skin. Roll the dough into balls. Working with one ball at a time, flatten or roll out dough to a length of about 8 inches and width of 5 inches. Fold in about 1-inch on both sides of the dough. Starting from the end closest to you, roll the dough into a log. Repeat with remaining dough. Place the logs seam-side down in a buttered and parchment lined loaf pan. Cover loaf pan with plastic wrap and let rest for 30-45 minutes until dough has doubled in volume. Lightly brush the top of the dough with heavy cream. Bake in a 350 degree F oven until the top of the bread is a nice golden brown and the internal temperature of the bread is at least 190 degrees F. If the bread top colors too fast, place a foil tent over it to prevent it from burning. Let the bread cool in the loaf pan for 5 minutes before unmolding, then allow the loaf to cool to room temperature on a wire rack. Once cool, go ahead and slice yourself a piece! Starter: In a medium pot, whisk together bread flour, milk, and water. Set over medium heat and stir often, making sure to stir the bottom edges of the pot. Cook for about 5 minutes until mixture has thickened to the consistency of mashed potatoes. Remove from heat and transfer to a bowl. Cover with plastic wrap, allowing wrap to lay directly on top of starter mixture. Allow to cool to room temperature. Dough: In the bowl of a stand mixer, whisk together bread flour, sugar, yeast, milk powder and salt. Attach dough hook to mixer. Add in 1/2 cup of cooled starter mixture, egg, and milk. Knead on low speed for 5 minutes. Scape down bowl to ensure thorough mixing. Add softened butter and continue to knead on low speed for 5 minutes until butter is integrated into dough. Increase speed to medium and knead for another 5 minutes until dough is smooth and pulls away from the sides of the bowl. 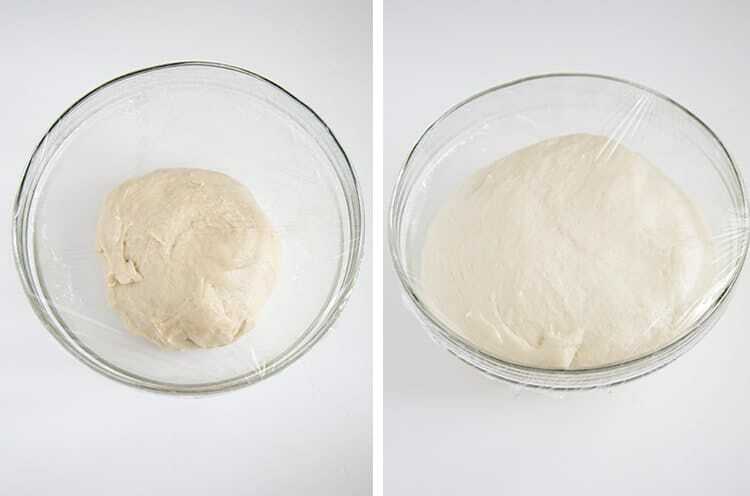 Transfer dough to a lightly greased bowl. Cover with plastic wrap and let rest for 1 hour, or until dough is doubled in volume. Line a 9 x 4-inch loaf pan with parchment paper. Grease and set aside. Transfer dough to a lightly floured working surface. Divide dough into four equal parts and roll into balls. Cover dough with plastic wrap as you work to prevent it from drying out or forming a skin. Working with one ball of dough at a time, flatten or roll out dough to a length of about 8-inches and 5-inches wide. Fold in about 1-inch of the sides. Starting from the end closest to you, roll the dough into a log. Place log seam-side down in prepared loaf pan. Repeat with remaining dough balls. Cover loaf pan with plastic wrap and let sit for 30-45 minutes until dough has doubled in volume. Lightly brush the top of the dough with heavy cream. 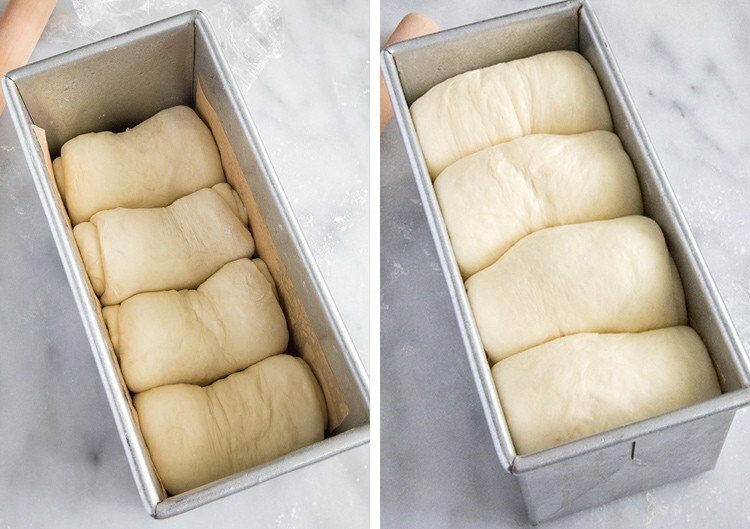 Bake dough in a 350 degree F oven for 35-40 minutes until the top of the bread is golden brown and internal temperature of bread is at least 190 degrees F.
Let cool in loaf pan for 5 minutes. 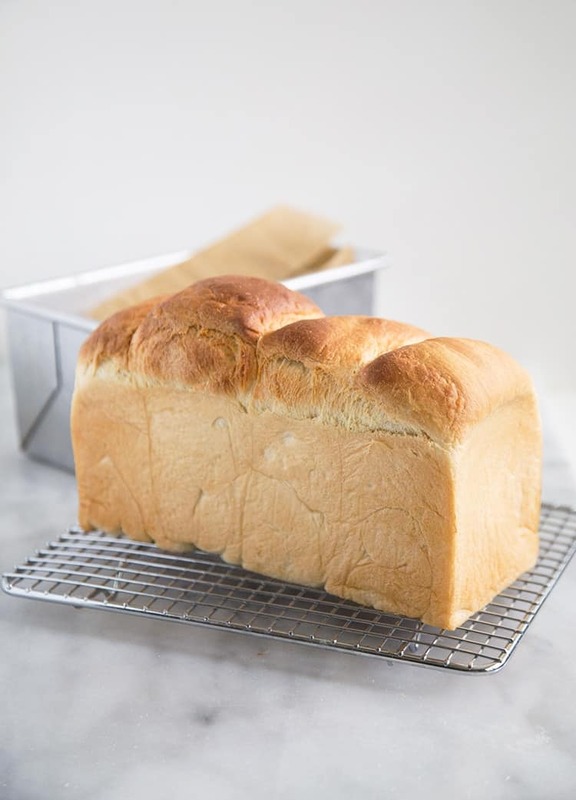 Unmold bread from loaf pan and allow to cool to room temperature on a wire rack. Once cool, slice bread accordingly. Starter mixture is enough to bake 2 loaves. Discard extra starter, or double the dough recipe to make 2 loaves. Milk powder provides additional flavor. It is optional and can be omitted. What do with this Japanese milk bread? This milk bread tastes great on it’s own. 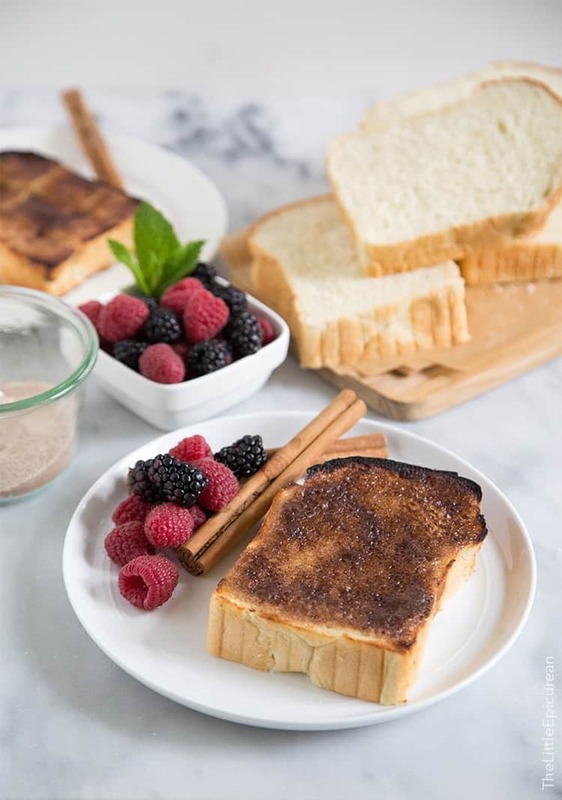 I mentioned that I enjoy milk bread with butter or condensed milk, but my MOST favorite way to eat milk bread… is this cinnamon sugar milk toast. Absolutely stunning pics, love! Seems like the Japanese have quite the tasty food – sushi, miso, this… :) I want to visit Japan so bad! Thanks so much Leigha! I studied in Japan during my last semester of undergrad. If you ever get the chance to visit Japan, you’ll absolutely fall in love! I have a seriously addiction to bread as well so this is right up my alley. Perfection! This bread looks delicious Maryanne. I have been getting more confident making things with yeast so I will definitely be trying this one! YESSSS! French toast milk bread would be out of this world! I am in love. I’ve tried to make bread so many times and it turns out like bricks every. single. time. If I kept all of them, there would probably be enough to build a sizable house for a dog. I can never get bread out of my diet either, it’s just too tasty! Although you are better than me because I definitely couldn’t get chocolate out of it ;) This bread looks so tasty! You’re making me real sad that I can’t eat a slice of this. Actually, I think this is the kind of bread worth getting a headache over – so I’ll take two slices covered in sweetened condensed milk please! (Also – I’m pretty sure this is the bread that modeled for the emoji bread artist). This recipe is awesome. I made this bread yesterday and filled it with taro puree which resulted in GREATNESS!!! Will whole wheat flour produce the same softness? YUM! Taro! I can only imagine how good it tasted! I haven’t tested this recipe with whole wheat flour so I’m not sure. You would have to increase the amount of milk and butter because whole wheat flour tends to soak up more moisture. If you give it a try, please let me know! Hi! How will the recipe change if I want to use it in a bread maker? Hi Bevlyn! Unfortunately, I don’t have any experience using a bread maker. Do you have any directions for making this bread into rolls? It is fantastic, but I thought rolls might look nicer for Thanksgiving presentation. Your site is absolutely fabulous and I can’t wait to try more of your goodies! Hi Karen! I’ve never made this bread into rolls. You can try using the directions from my Filipino Bread Rolls (https://www.thelittleepicurean.com/2015/08/pandesal-filipino-bread-rolls.html). Thanks so much for stopping by. I wish you a wonderful Thanksgiving! I love this recipe! I’ve made it several times and it’s always delicious. Even toast feels like a treat now! I do have one question – I find I’m not getting as much of a rise as I expect. Should I be proofing the yeast, or adding it dry to the other dry ingredients? The loaves I’ve made without salt seem to do better, so I’m concerned that adding the yeast in with the salt and flour is killing it. I appreciate any suggestions, but I’ll keep making it either way! Hi Laura! That’s great to hear! Thanks for trying out the recipe! Salt does slightly inhibit the growth of the yeast, however just minimally. Is your yeast past it’s expiration date? Perhaps the ingredients are too cold, or the temperature of the room is too cold. Also over proofing can deflate the yeast. You could also activate and start the yeast in warm milk, before you add the the starter and egg. I love making this bread. Once, instead of making 4 balls, I made 8 small ones. Using a round springform cake pan, rolled the balls into logs, then put 7 of them around the walls and 1 in the middle. They made the best dinner rolls ever! Thanks for trying out the recipe! I’ll definitely need to try making smaller rolls. Thanks for your recipe. I made this today. It is very fluffy and soft. It is definitely a keeper. I grew up in Japan and I love this recipe!!! I followed your recipe and it came out great. This bread reminds me of my childhood. The only thing I wanted to ask is my dough was very wet and sticky. i had a hard time to put the dough together (but this bread is seriously tasty!). I ended up with adding more flour… Currently, I live in Hawaii and it’s humid here. Do you think I should use less milk or add flour? Hi Akiko! Thanks for trying out the recipe. I’m glad you liked it! Humidity can definitely affect the bread. I suggest adding a little more flour, about 1 tablespoon at a time until it’s easy to work with. It’s better to have the bread on the wet/moist side, rather than over-floured and dry. I hope that helps! I made two loaves today. FABULOUSLY delicious and so easy! That’s wonderful! Thanks for trying out the recipe! Made this today. Absolutely addictively fabulous! After posting pictures on Facebook, I had multiple requests to mail care packages of bread! Will be making quite often!! That’s wonderful to hear! I’m glad you liked the recipe! Hi! I’m also in Germany and so wonder: what is the German equivalent of “bread flour”? Could you perhaps recommend a brand or where I could probably find some? Many thanks! I use King Arthur Bread Flour. It’s available for purchase online and they offer international shipping. Bread flour is often labeled as “high protein flour.” I hope that help! My wife is Japanese and she gave my first batch of bread a thumbs up–She usually buys this bread from a Japanese bakery across town. Nice soft fluffy texture. Next time going to see if I can get my bread machine to do some of the work. That’s wonderful to hear! Glad you enjoyed it. Thanks for trying out the recipe! I made this as well as your pan de sal recipe. What joy! They’re delicious and my husband and I love them. I have for the last three weeks been baking our own bread. Thank you for so generously sharing. Thank you thank you for this recipe!! I’ve always wanted to make this ever since I tried it on a trip to Japan. But being from the only country that doesn’t use the metric system, it was really hard to find one I can try without running out to buy a scale. Hi there! I’ve previously made your Melon-pan and now I want to attempt this too! Thank you so much for the easy to use (and British measurements =P) instructions. Thanks for trying out the recipes! Instead of cream, you could brush the tops with milk. It may not brown as much, but it’s better than nothing! 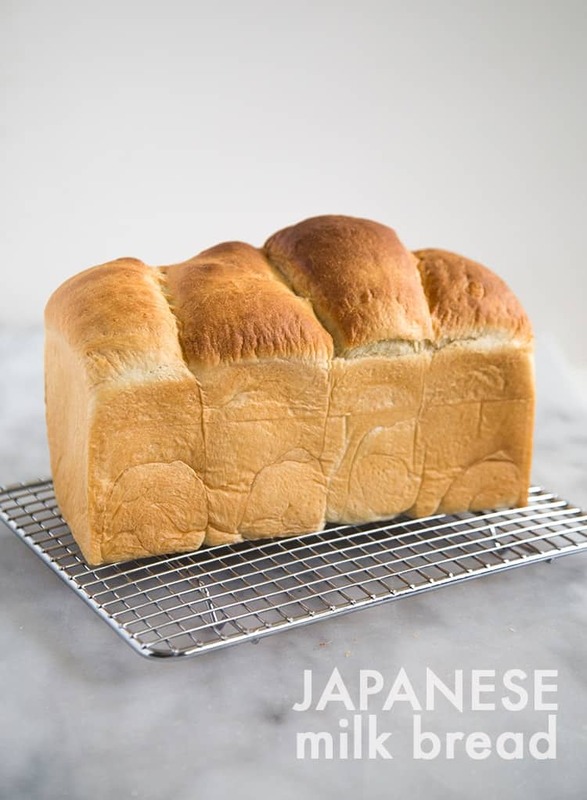 Thank you so much for posting this Japanese Milk Bread recipe! It looks amazing and hope to try making it soon. I don’t have a stand mixer (yet), so any ideas how to make bread without one? Should I knead by hand for 5 minutes? You can mix the dough by hand without a stand mixer. It will take a bit of patience. Knead the dough by hand until it is soft and smooth. That can take anywhere from 5-15 minutes. Hello! I tried this recipe out, but it came out with the consistency of cake – what am I getting wrong? I have been using plain flour – adding baking soda and salt – it is rising well – i just doesn’t have a bread texture at all. Why did you add baking soda? Baking soda will affect the yeast. I quite enjoy milk bread and have used other recipes on occasion. This time around I thought I’d try yours and I must say that it is without a doubt the best. A friend and I are starting a bread and jam table at the farmers market. This recipe will undoubtedly be our best seller. Much appreciate your sharing it. Bon appetite mademoiselle. I suggest using bread flour due to it’s protein contain. I would not use whole wheat flour because that will dry out the recipe. Whole wheat flour requires more moisture in the dough. I have only tested this recipe using non-fat milk powder. Can you explain why you make twice the starter than what is required? If you try to make a starter with just the right amount for one loaf, it’s a bit difficult to mix together. I make double the amount simply for the sake of easier mixing, but also because I tend to make more than one loaf of bread at a time. What a forgiving recipe. This is the 2nd time I’ve made it in a week. I made a mistake today and put the dough to rise on a warm spot on my stove. Too warm – it rose way too much and actually caked on the bottom. Separating it into balls was nuts because it was so goopy. Didn’t matter. Bread came out just as fabulous as the first time. Thank you. I’ve just been struggling with this recipe as it produced a very wet dough and I just realized why, I was only meant to use half the starter that was prepared in the beginning. I think it would be an improvement on the way the recipe is written of this information was added in the section about the starter and not just at the very end. I found this recipe to be very wet, but knowing how dough is suppose to look, I continued to add bread flour until it came off the sides of the bowl. After that, it was very easy to control and they came out perfectly. Now we still have to do the taste test, but I am confident they are perfect. I wish I could attach my picture.